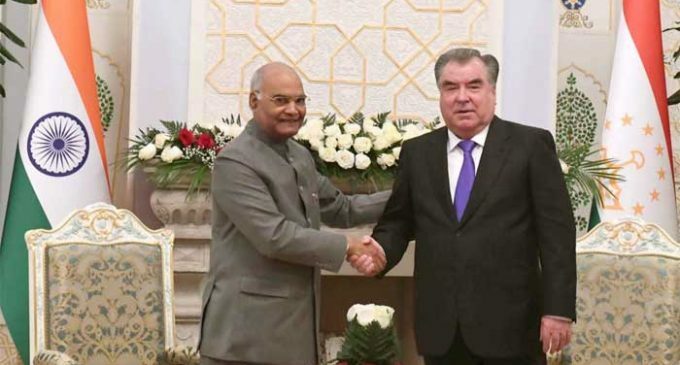 Dushanbe (Tajikistan), Oct 8 (IANS) India and Tajikistan agreed to work together to boost connectivity and join hands in the fight against terror as they signed eight pacts in various sectors after a meeting between Indian President Ram Nath Kovind and his Tajik counterpart Emomali Rahmon here on Monday. 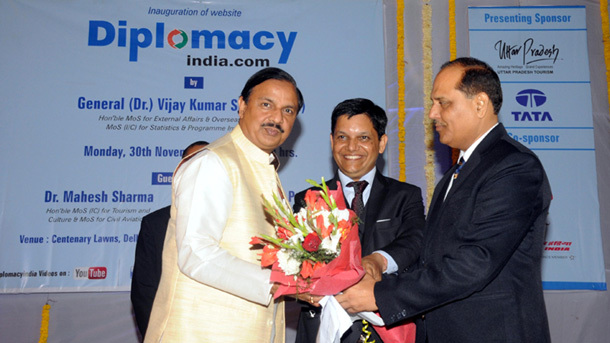 “Connectivity is vital for realising the full potential of our Strategic Partnership and economic relations,” Kovind told the media. “Together, India and Tajikistan can promote the International North-South Transport Corridor (INSTC) and other connectivity initiatives such as the development of Chabahar port and the Ashgabat Agreement for smooth transport of goods,” he said. The INSTC is a 7,200-km-long multi-modal network of ship, rail and road routes to move freight between India, Iran, Afghanistan, Armenia, Azerbaijan, Russia, Central Asia and Europe. India, Iran and Afghanistan are jointly developing the Chabahar port in southeastern Iran which will be a key link in the INSTC. Earlier this year, India joined the Ashgabat Agreement which seeks to establish an international transport and transit corridor between Iran, Oman, Turkmenistan and Uzbekistan. According to a joint statement issued following Monday’s meeting. Kovind and Rahmon emphasised the importance of regional efforts to expand transit and transport corridors that promote connectivity between Central Asia and India. “Both leaders reiterated strong support to development of the International North-South Transport Corridor which will considerably reduce time and cost of transport of merchandise among India, Central Asia, Caucasus and CIS countries,” it stated. Pointing out that the region was beset with challenges posed by fundamentalists and terrorists, Kovind said that both India and Tajikistan remain determined to counter all forms of terrorism and violent extremism. “I thank President Rahmon for his support for early adoption of the Comprehensive Convention on International Terrorism (CCIT) at the UN,” he said. The CCIT is an India-initiated proposed treaty tabled in the UN in 1996 which intends to criminalise all forms of international terrorism and deny terrorists, their financiers and supporters access to funds, arms and safe havens. Kovind said India was committed to peace and development in Afghanistan through an Afghan-led, Afghan-owned and Afghan-controlled peace process. In view of the rising threat of terrorism, religious fundamentalism, extremism and radicalisation to regional and global peace, Kovind and Rahmon stressed on cooperation to do away with terrorism in all its forms. Both leaders expressed concern on the security situation in Afghanistan and the high level of violence caused by all terrorist groups. The statement said the two leaders underlined the need for long term bilateral defence cooperation to contribute to regional peace. “The two leaders noted the overall rise in bilateral trade in 2017 but reiterated that bilateral trade, investment and economic activities are not matching with the potential and rates of economic growth in the two countries,” it stated. Kovind said that India remained committed to provide capacity building and development assistance support to Tajikistan. “We are happy to offer a grant of $20 million for financing development projects as identified by the government of Tajikistan,” he said. Following the meeting, two sides signed MoUs in the fields of political relations, strategic research, agriculture, renewable energy, traditional medicine, space technology, youth affairs, culture and disaster management. Kovind arrived here on Sunday on a three-day visit.